Aubrey Fitzwilliam is considered a renegade and traitor in his own land. instead of seeking to right this problem he chooses to track down his enemy Dr Mordecai Tremaine. To do this he ventures deep into the heart of enemy territory and finally has Tremaine in his crosshairs. Things seldom go smoothly for Aubrey though and what he uncovers at Tremaine’s base leaves him wondering and very worried. He has known for a while that his enemy was seeking immortality and that the path to that is a bloody one, but what Tremaine appears to be doing to attain his goal leaves Aubrey’s blood running cold. A terrifying combination of electrical science and cutting edge but soul shattering magic seems destined to bring the world far closer to destruction than most people realise. Only Aubrey appears to grasp what is going on and how much is at stake.To stop Tremaine may cost Aubrey the very life he fought so long to save. Fortunately Aubrey isn’t alone. Wow, what a way to end a series. I feel I should warn you I may gush a little here but this is the final book in this series so I am going to talk about the things I loved about these books. Aubrey, for all his ability is a very thoughtful and moral character, though he is in no way perfect. He doesn’t always know the answer but he always tries. He stands for what he believes and does what needs to be done without much thought about personal accolades, he just doesn’t want to let his friends or family down. George is a wonderful counterpoint to Aubrey, in so many ways. He is in no way considered less by Aubrey because he has no magic, like a true friend Aubrey sees George’s strengths and abilities and he values his friend for them. Caroline is a wonderful character. She is strong, smart and thoroughly enjoyable to read about, though like her friends she is in no way perfect. It is a real pleasure to find stories where the girls are strong of mind, will and ability. Where they are able to go toe to toe with the boys and in a manner that is indicative of equals. Caroline doesn’t need magic to stand side by side with Aubrey she just needs to be herself. In addition I’d like to mention the suffragette movement in these books. It never seemed preachy to me and I think that is a credit to Pryor and the way he developed and wrote Caroline, Lady Rose and Sophie. Dr Mordecai Tremaine is all about power and self. He is not a character we ever like or even really understand, but as Aubrey tries to do just that, he comes to know more about himself. This really works on two levels; the character development of Aubrey and in giving texture to the story as a whole. These were the first steampunk novels I bought and I love them. I found myself totally immersed in the world Pryor created; the depth of character and a story wonderfully balanced with action, espionage, humour and humanity. These books are filled with light and shade. The labyrinthine layers to Tremaine’s plotting may have gotten confusing, clunky or even obvious in another’s hand, but Pryor never allows it to get that way. Cleverly and seemingly effortlessly (though I am sure it wasn’t) he weaves complex pieces together producing a fascinating and addictive read. I think I am going to miss these characters. Albion is at war. As much as they had hoped to avoid it, war is upon them and Aubrey and George can’t sit back and do nothing. On the way to signing up they find themselves swept into roles at the Directorate, a joint force comprising of the Magic Department and the Secret Services. Aubrey believes he George and Caroline make the perfect combination for a special unit, though it appears the military hierarchy may have other ideas. Before long Aubrey’s team find themselves in a far more precarious situation than their superiors believed it to be when they sent them in. Sent to establish a safe base and investigate mysterious magical emanations. Instead they discover something far more horrible than they could have imagined. Aubrey has to decide if they are going to obey their orders and just observe or step in and do all they can to prevent what will be a terrible bloodbath. Aubrey is back and facing the weighty decision of how best to live up to his family name. He isn’t the sort of person who could or would sit back and allow others to step up when he is perfectly capable of doing something. He is a moral and forward thinking character who still remains somewhat unbalanced when around Caroline. His abilities make him powerful but he doesn’t revel in this, he takes pride in his abilities, accepting that it means he can he can step up. He is an example of the saying ‘with great power comes great responsibility’. Aubrey is the antithesis of his arch enemy Dr Tremaine. Tremaine is a great bad guy, he is canny, talented, super smart and totally ruthless. Pryor has created a world that has depth and colour all of it’s own. The three central characters gel so well, they balance and ground each other and the addition of Sophie is an artful touch. It brings new energy to the team, with none of them seeming out of place. With a truly deft hand Pryor untangles layer upon layer of plotting, to bring problem after problem to the fore and creative solutions out of our heroes. (I’m sure Caroline would dislike the addition of the word heroine here). Then he leaves us with a final twist that had my hand desperately reaching for book 6. Aubrey Fitzwilliam is taking part in the nobel pursuit of cricket, but it seems even something so ordinary cannot stay that way with Aubrey around. The magical attack when it comes is quite impressive. Then into Aubrey’s possession comes the mysterious Beccaria cage and it could be the solution Aubrey has been looking for – a way to reunite his soul and body once and for all. But then it could also be something else, hiding a secret agenda. Then something happens to Aubrey and he only narrowly manages to escape a terrible fate thanks to his friends George and Caroline. Then more decidedly unusual things start to happen and Aubrey decides he has only one real course of action – confront his nemesis Dr Tremaine. With the ever trustworthy George and the dauntless Caroline at his side, Aubrey travels to Holmland’s capital Fisherberg. He is deep in the heart of hostile territory here yet with all things Aubrey gets entangled in it doesn’t stay focussed in one direction. Before he even arrives he is thrown off a train and finds himself mixed up in a plot involving brigands and black market weapons. As well as the usual magical conundrums and near death experiences there are ghosts to deal with. Can Aubrey deal with everything and do enough to prevent Dr Tremaine’s plotting before the world is plunged into war? 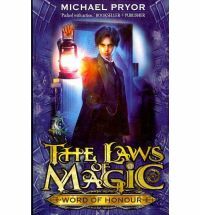 Another exciting and entertaining installment in the Laws of Magic Series. It is so easy to get swept away into the intrigues of this world and the smalled but none-the-less important issue of Aubrey’s great dilemma. 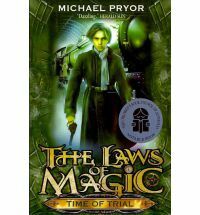 There is sophisticated magic, quick thinking and characters that just work so incredibly well together all in a world bought to life through Pryor’s wonderfully steam punk descriptions. These were the first speampunk novels I read and I very quickly became addicted. Being the son of the Prime Minister presents itself with some interesting opportunities. Sometimes even quite unexpected ones, like helping your father avoid his bodyguards and sneak into a naval base for a test ride on a new top-secret submersible. It stops being so fun when a magical attack threatens to send the sub to the bottom of the ocean. When that is partly under control they rescue a merchant vessel in trouble only to discover Aubrey’s mother, Lady Rose, and Caroline on board. These events trigger a series of others that interfere with George and Aubrey’s attempt to immerse fully into their new lives at university. Instead they find themselves caught up in plots to rob Albion’s largest bank, political uprisings, the disappearance of street urchins no-one will supposedly miss and strange underground disturbances. Then there is the opera singer who bears an uncanny resemblance to Aubrey’s nemesis Dr Tremaine, something no-one but Aubrey seems concerned about. With all this going on how can he possible concentrate on his studies. 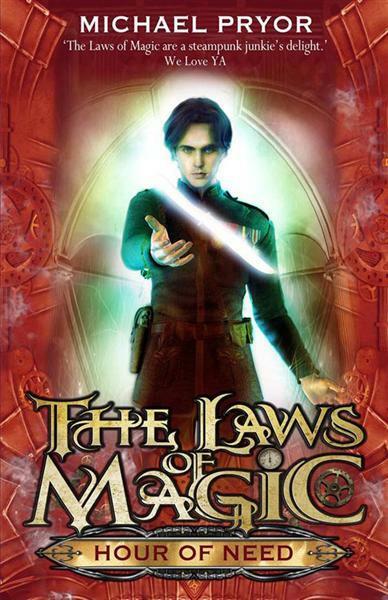 Book 3 of the Laws of Magic series and it is still going strong. Pryor keeps the action and intrigue coming thick and fast. After all one problem is never enough for Aubrey. There is plenty of steampunk adventure and magic. George is wonderfully loyal and grounding, Aubrey is is clever yet flawed – a character you like even more because he does make mistakes. (Will Caroline ever forgive him or is that something he has broken beyond repair? )Once again what could have turned into a confusing tale of many intrigues is well handled and entertainingly written. Bring on the next book. It starts with a night-time rescue mission which ends with Aubrey and George deciding it’s time they took a holiday. Aubrey should know nothing in his life is that simple though and truthfully that is how he likes it. Still it all looks a bit much when, before he has even set off, his tasks to complete along the way include: solving a royal mystery, finding a missing ornithologist, acquiring some old correspondence between his grandparents, and his father throws a spot of diplomatic espionage for good measure. When he gets there though he finds yet another task grabs at his insatiable curiosity – some one is stealing people’s souls and leaving them as mindless monsters. Added to all of this the Heart of Gold has been stolen, considered the country’s magic lifeline it’s disappearance leaves the city in chaos. With everything going on will Aubrey manage to find time to be with Caroline or find a cure for his condition. 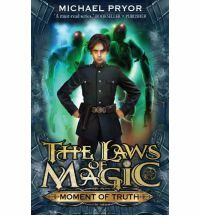 Another wonderful steampunk novel from the talented mind of Michael Pryor. You might think with all those different plot strands that things could get confusing. They don’t. 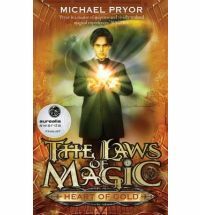 Pryor deals with all the elements of the story with deftness, seamlessly weaving the strands together to create a wonderful and detailed story that is crammed with action and magic. His characters are strong, flawed and wonderfully real, perfectly complementing each other. I am a big fan of this series.